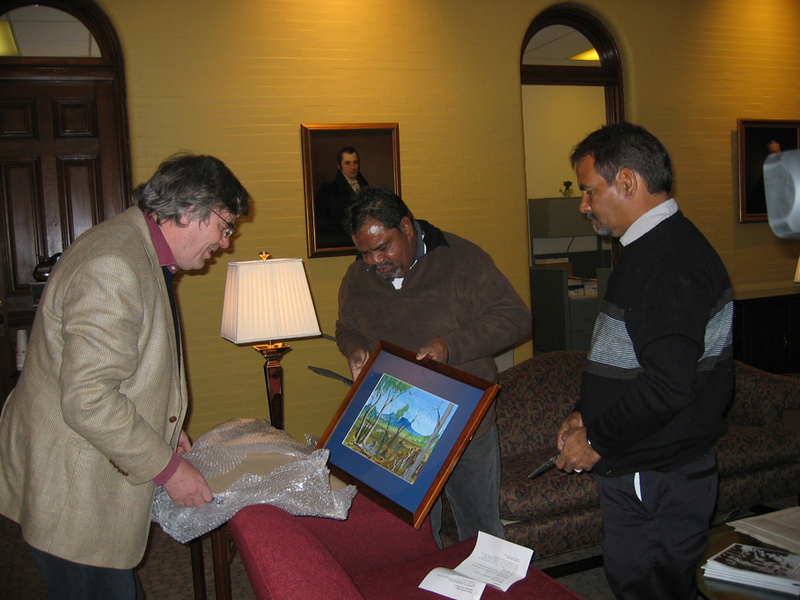 Howard Morphy and Ezzard Flowers inspect the painting that Athol Farmer brought from Katanning to give to the President of Colgate University, Rebecca Chopp, 12th April 2005. Berndt Museum of Anthropology, The University of Western Australia. It had been a long journey, though both space and time. Here we were, paused at the lintel of the Storeroom at Picker Gallery, Colgate University. 18,432km from home, to be precise. We were about to relink ourselves with the ‘lost’ Carrolup artworks, 55 years since they had left Noongar boodja, Noongar land and people. My own journey spanned just 20 years. Noongar people have lived in the South-West of Western Australia for over 45,000 years. Kind of puts things in perspective, doesn’t it? And the three of us are part of this long journey. I was with Ezzard Flowers and Athol Farmer, two Noongar elders who had travelled with me to inspect the rediscovered collection. It was an electric moment, the three of us paused outside the door. We had told the Picker Gallery staff that we would need time alone to re-connect with the children’s art. We had discussed our protocols at length during the course of our seemingly never ending flight across the Pacific from Australia, and on across the United States. Over 24 hours in the air, another 12 en route, and finally, a two hour drive in a van to our destination. We were thinking of families and friends at home on Noongar Boodja, and of the spirits of the young boys who created these amazing artworks. We knew that seeing them for the first time would be emotionally difficult, as well as a great honour to play this role. We entered the room, and closed the door quietly. The walls were covered with racking containing framed artworks. But the focus of our attention was the table in the middle of the room, covered with dozens of tiny pastel drawings, some larger than others, some still in their original encapsulation, others being prepared for mounting. It was a momentous event for the three of us. We walked slowly to the table, embracing, each of us deep in our respective thoughts of what this experience was meaning to us, and to people in Australia—Noongar and non-Noongar, alike. We did not hold back our tears. Fresh in our minds was the message we had recorded with Uncle Angus Wallam at Marribank just eight days earlier. We had just played it on DVD to the President of Colgate University, at the Official Welcome she had given. Howard Morphy from the Australian National University, was with us for the occasion—he had been fortunate enough to stumble upon the ‘lost’ collection, and also to be in the position to recognise it for what it was; it’s importance, and its significance to Australian art history and Noongar culture. Our tears fell on the floor of the storeroom, a little piece of Noongar-Boodja-by-association, having cradled the collection here in the State of New York for the previous 39 years. But we were careful not to let our tears fall on the artworks themselves, as many were without covers. Ezzard and Athol will give their own perspective on this event in an accompanying Blog; it suffices here for me to reflect on my own recollections. As I said earlier, this has been a long journey, my own role much more recent than some others. For not only are we to thank and honour the child artists of Carrolup themselves, as creators of this amazing Australian school of art, but we also need to consider the respective roles of others. First, of course, there is Noel White, who encouraged the children to ‘see what they looked at’ and his wife Lily who was there to support and encourage him at every turn of the road. Then there is Florence Rutter, the classy Englishwoman inspired to become the key ambassador for the Carrolup School. Vera Hack, who drove Florence to Carrolup on her second trip there, and who took photos of her with the boys and girls, and made a short 16mm Kodachrome movie of the occasion, which unfortunately we have never been able to locate. Maybe it will turn up someday, just as the ‘lost’ collection has done. A subsequent generation of family members has kept the story alive: Florence’s daughter Margaret Edenburg and her sister Doris Flatt, the White’s daughter Noelene and her brother Ross. And then, more latterly, is Stan Phillips who amassed a key collection of the works now held by the Berndt Museum at the University of Western Australia. All these people were vital players in the story, and started walking this journey long before I came along. Subsequent blogs will detail elements of this. But for the three of us present on that day at the Picker Gallery, on the 12thApril 2005, the profound feelings we shared of joy and excitement were mixed with a deep sense of sadness that all but one of the boys had by now passed away and would never know: only Milton Jackson was still with us. The sense of the boys’ spirits around us was almost tangible in that room, as we spent the next few days examining each of the artworks, talking about them, appreciating them, and through the tactile link of our hands and fingers, reinvigorating them. There were more in another room, the Print Room, which Picker’s staff had already remounted in acid free boards. We looked very carefully at each work, evaluating it, as we were here to ask if we could borrow about 20 works to bring back to Katanning for an exhibition as part of the 2006 Perth International Arts Festival (PIAF). We picked the best examples that we could find, the least rubbed and what we felt were the most powerful (pastel drawings are very delicate and readily smudged, as many of these examples had been, encapsulated as they were by Florence Rutter to protect them during the European exhibitions). One of the works was by Milton Jackson. The three of us were thrilled that at least he would be able to see one of his ‘lost’ works again….